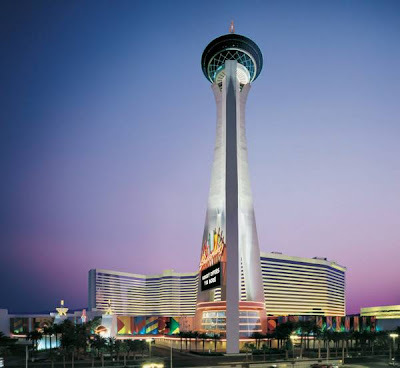 On our upcoming trip to Vegas, Gerry and I, will be admiring the Las Vegas skyline from the Stratosphere Tower located at the Stratosphere Casino, Hotel and Tower on the strip. This is the tallest freestanding observation tower in the United States, towering over the city at 1,149 feet. Indoor and outdoor observation decks with spectacular panoramic views are not all that the Stratosphere offers. At the top of the tower you can enjoy night time venues and Top of the World restaurant which rotates 360 degrees as you dine-allowing you to see glimpse some things that Vegas has to offer. The truly brave at heart can enjoy the world’s highest thrill rides and the tallest controlled free fall in the world at Sky Jump Las Vegas that sends you flying off the 108th floor. We hope to dine in the restaurant, but we will definitely skipping the free fall and leave our excitement for the casinos.